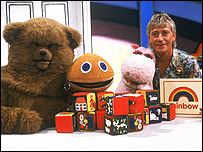 Rainbow has topped a public survey on the most popular pre-school children's TV shows of all-time. The series, featuring George the hippo, loudmouth Zippy, human pal Geoffrey and Bungle the bear, beat The Magic Roundabout to first place in the poll. Animated time traveller Mr Benn was joint third with Play School in the list, followed by Bagpuss. 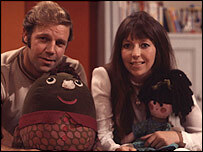 The poll, conducted for new magazine CBeebies Weekly, saw 1,000 people aged 25-45 pick their favourites. The rest of the top 10 consisted of The Wombles, The Clangers, Trumpton, Button Moon and Camberwick Green. Rainbow mixed comic storylines, featuring the four main characters, with quirky animations and musical interludes by Rod, Jane and Freddy. It was created to help fill daytime schedules when broadcasting hours were liberated in the early 1970s, but was cancelled when production company Thames lost its ITV franchise. Digital channel Nick Jr started repeating a Rainbow series from 1982 earlier this month as part of its evening nostalgia programming. The Magic Roundabout, which was created in 1965, was revived as a film in 2005. Pop star Robbie Williams and actors Sir Ian McKellen and Bill Nighy were among those adding their voices. Other shows to make it into the top 20 included Jackanory, Rhubarb and Custard, Paddington Bear and Captain Pugwash. Which is your favourite children's programme?